JIASHAN FIRST OILLESS BEARING FACTORY is one of the leading manufacturers of sliding bearings in ZheJiang . The products cover a vast range of applications from the automotive industry,construction & agricultural equipments to light industry, material handling, shipping machinery and the military industries.We have complete and accurate CNC-machining processing equipment and sophisticated inspection and testing equipment, which makes our products much competitive。 Now we are producing sliding bearings of 16 different series including SF oilless bearings, JF Bimetal Bearings, FB bronze bearing, JDB solid lubricant embedded bearings and etc. 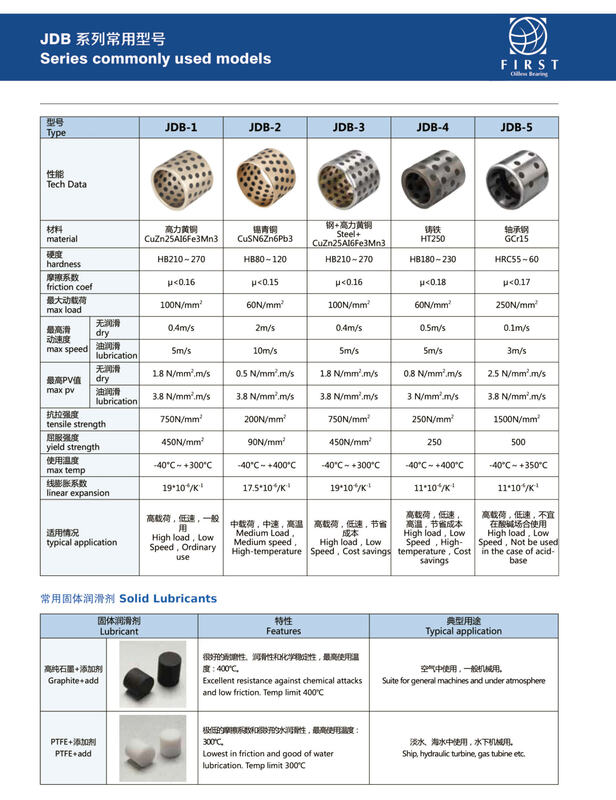 They have been adopted in high-temperature, high-speed and many other applications. With a professional and strong technical team as well as good testing facilities。 Security policy: safety first, taking precautions, implement our responsibilities, standard operating. Environmental Policy; cleaner production, energy-saving and emission-reduction, environmental improvement, civilized emerging. These principles will guide us work effectively in the aspects of strategic, security, environmental protection.